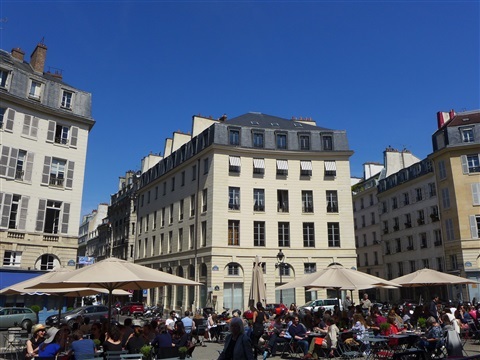 We will begin our walk in the Odéon area, continuing through the lively streets of Buci and Saint-André-des-Arts areas and will finally come back to boulevard Saint-Germain reaching our starting point at metro Odéon. 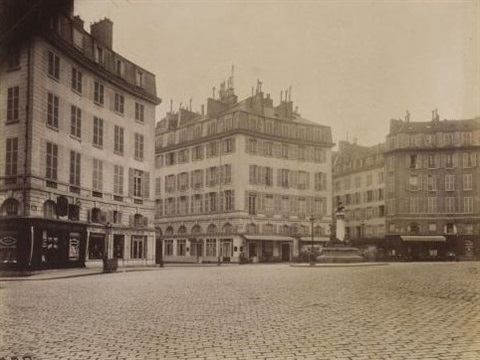 Though we will be strolling mainly in the 6th arrondissement, we will cross several districts, looking quite different. Although different, they are all marked by literature and arts, and also by history, especially the revolutionary period. 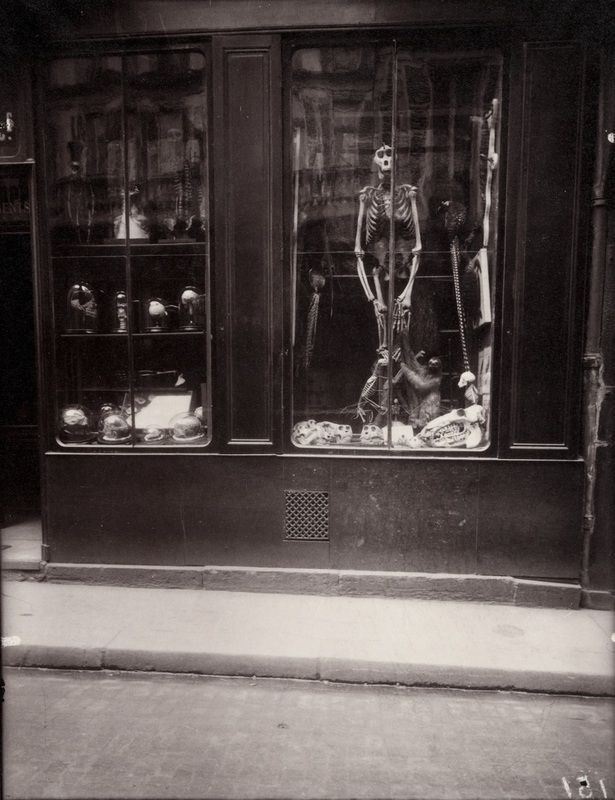 No specific theme for this wandering, other than enjoying the atmosphere of this district and of course following the invisible thread of the places captured by the photographer Atget. We start from metro Station Odéon (or station Saint-Germain Odéon on bus 63, 86, 87 or 96) and we go toward Carrefour Odéon and take rue de l'Odéon up to Place de l'Odéon. 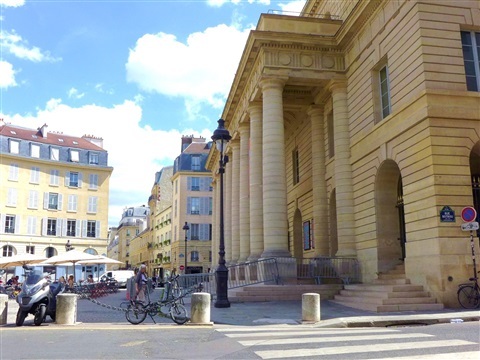 I always have the same pleasure walking rue de l'Odéon, along the shops and bookstores having a beautiful view on the theater with Jardin du Luxembourg sitting like behind the scenes. 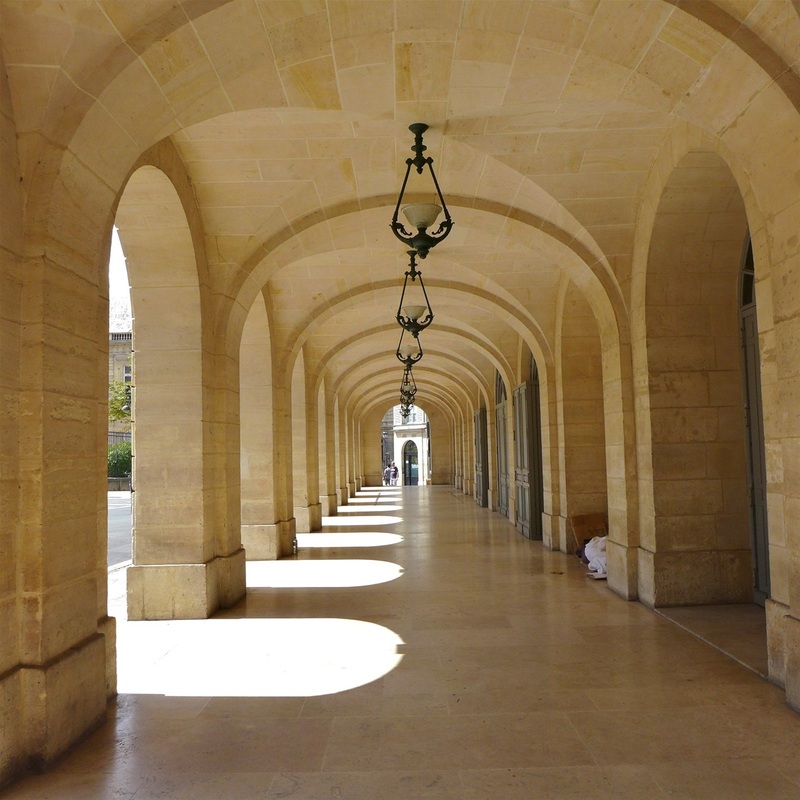 As soon as the weather is nice, the half-moon shaped square is occupied by a terrace in front of the classical colonnaded theater. 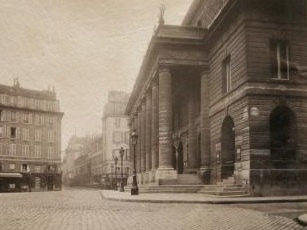 Open in 1782, it is the first monumental theater built in Paris, providing a more convenient home for the King's Players (Les Comédiens du Roi) than the one located at rue de l' Ancienne Comédie, too small. Twice burned down and rebuilt in the past, it has been recently renovated after four years of major restoration works between 2000 and 2006 and continues to provide classical and modern high quality plays. I was reading recently Anne Wiazemsky’s book, Un an après (One Year Later) telling her relationship with the filmmaker Jean-Luc Godard, engaged in the political battle during the social turbulence of May 1968 in Paris. She describes her exhilaration during the early stages of May 68, then, her confusion and fears during the demonstrations and her rage to see the Odéon theater, sacred place for her, devastated and ransacked by the demonstrators who managed to occupy it. 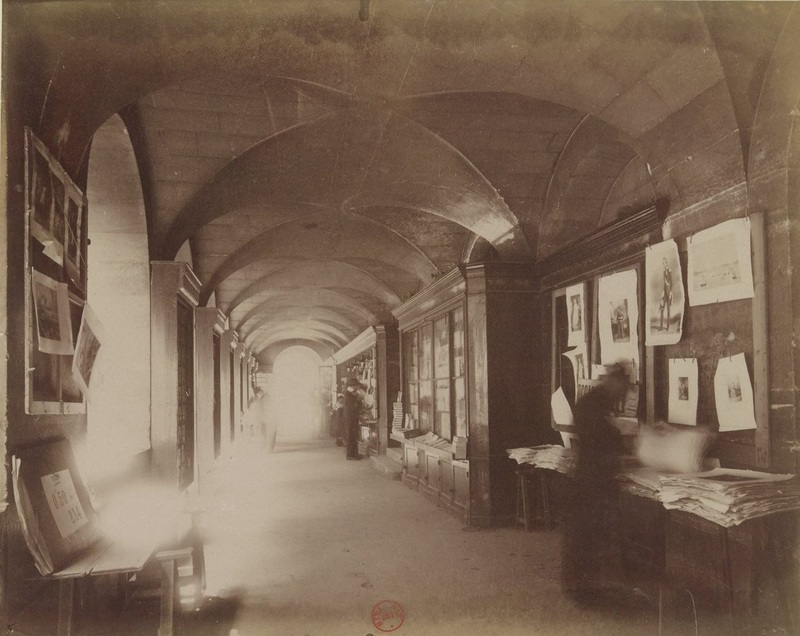 As can be seen on the picture taken by Atget, the theater arcades used to be dedicated to the book selling. The publisher Flammarion started there as a bookseller. The book selling activities under the arcades stopped in the 50s. 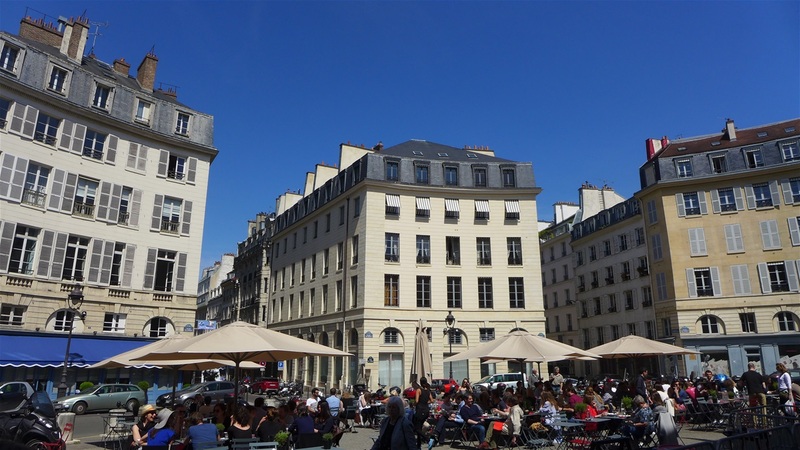 Flammarion is now located at nr1, place de l’Odéon, where was Café Voltaire founded in 1750, a favorite place for writers and poets for many years, like Verlaine, Rimbaud, Mallarmé, Gide, Valéry … It was also the favorite spot for the writers who gathered at the two avant-garde bookstores located rue de l’Odéon: Shakespeare and Company * owned by Sylvia Beach and la Maison des Amis des Livres owned by Adrienne Monnier. These writers where Hemingway, Scott Fitzgerald, Ezra Pound named by Gertrude Stein the Lost Generation because of the World War 1. In my introduction, I was mentioning the fact that this neighborhood had been marked by the Revolutionary period. 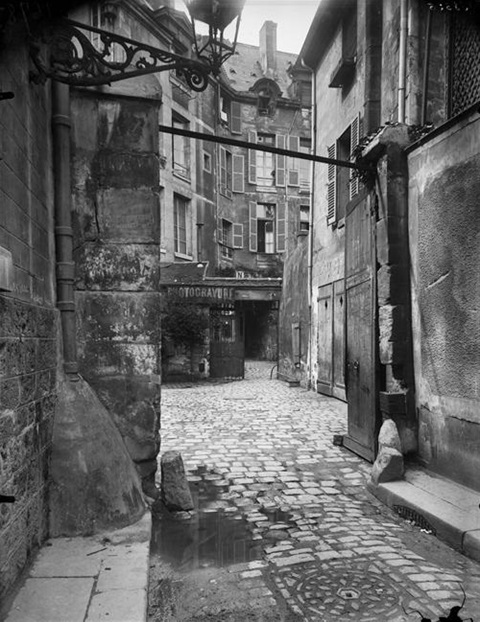 Camille Desmoulins was living here at no 22, rue de l'Odéon at the nearby Cordeliers Convent where he met with Danton and Marat. Arrested at home the same day as Danton, he was taken to the nearby Luxembourg Palace transformed into a prison, before his execution the 5th of April, 1794. Let's go now rue de l'Ecole de Médecine, where used to be the Revolutionary Cordeliers Club taking its name from the Convent. 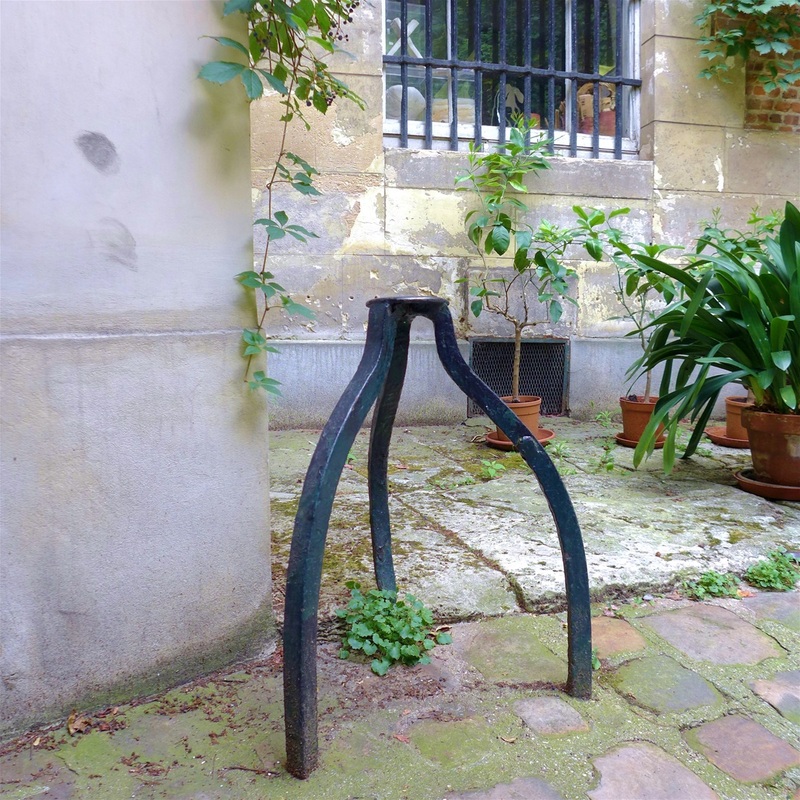 For this, let's follow rue Casimir Delavigne, cross rue Monsieur le Prince where there are several bookstores including two English ones; and finally let's go down few steps rue Antoine Dubois which leads to rue de l'Ecole de Médecine. 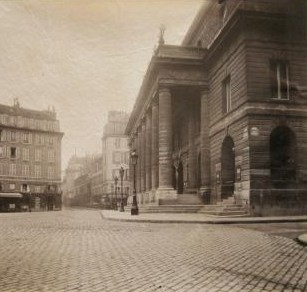 The Cordeliers Convent was standing where, is today the Faculty of Medicine. 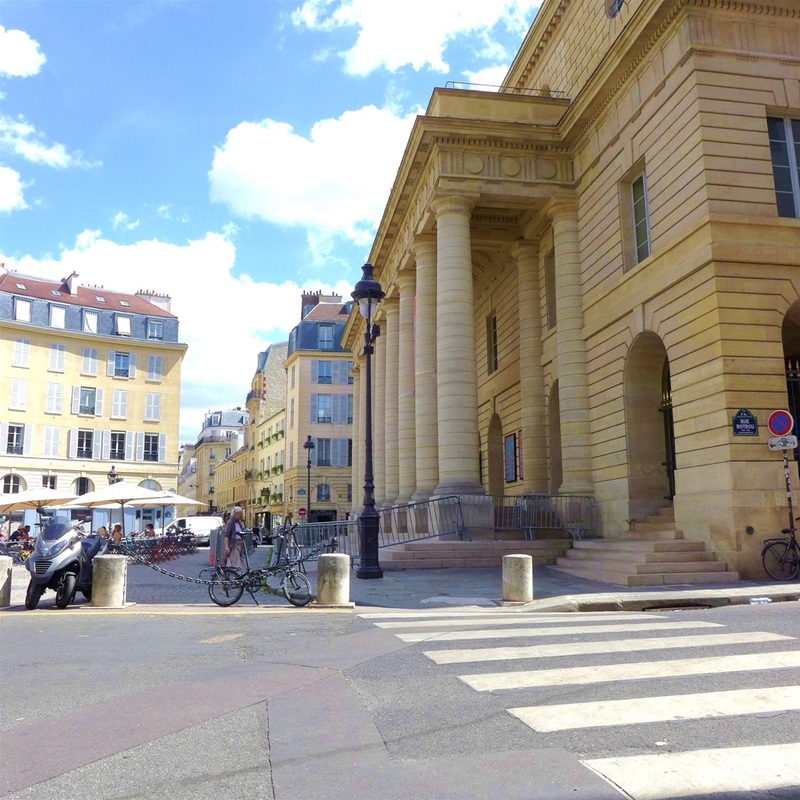 This is where the members of the Cordeliers club were meeting during the French Revolution. 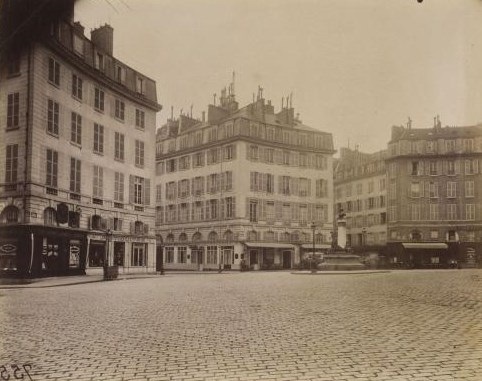 One of them, Marat, was living in a nearby house which was destroyed when boulevard Saint-German was built. This is at his home that Marat was stabbed to death by Charlotte Corday, the 13th of July, 1793, when he was in a sulfur bath as a remedy against a severe skin disease. Before the burial in the garden of the convent, the state funeral of Marat was dramatically arranged by the painter David in the Church of Cordeliers. The corpse, draped under a wet sheet in imitation of antique statues, was exposed on a high tricolor platform against which the crowd thronged. Since the church and the burial place were very close, David organized a long procession starting rue des Cordeliers, stopping at the Pont-Neuf bridge where cannons fired a salvo, then coming back via Pont aux Changes bridge to Odéon theater. Beyond his death, Marat somehow continued to participate in the revolutionary debates as his embalmed heart was sealed into an urn and suspended from the Club's ceiling. 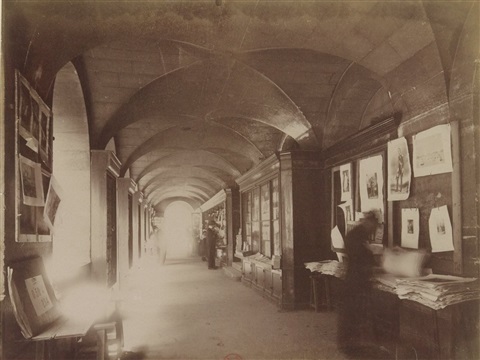 With the building of the School of Medicine, nothing is left, but the refectory (Réfectoire des Cordeliers) - today under major renovation - and the Marat's bath tub that can be seen at the Grévin Museum. Let's now cross boulevard Saint-Germain and go straight ahead rue de l'Eperon; on our left, let's take the narrow and quiet rue du Jardinet, now a dead end since the three successive courtyards of Cour de Rohan is now closed to the public. Because, it was a dependence in the XVth century of an old mansion owned by the cardinal of Rouen, it got the name of Rohan or Rouen. 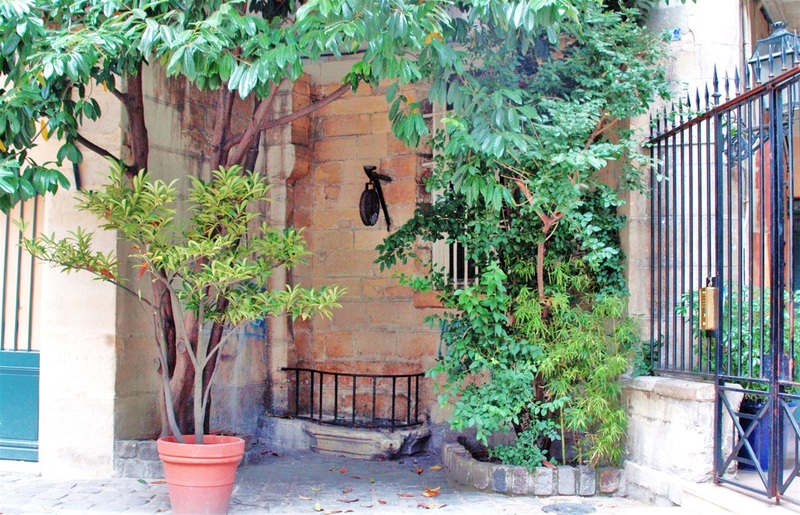 Not that long ago, it was possible to walk between rue du Jardinet and Passage du Commerce through the quaint three courtyards. 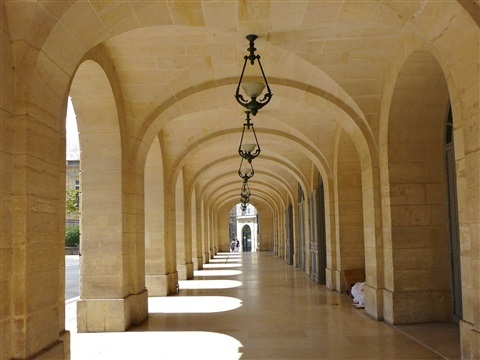 Today, there is the only possibility to have a look from behind the gate of rue du Jardinet; from there you will be able to see the first courtyard and the elegant brick and stone facade high above the second courtyard. The last time I came I was very lucky to meet with a charming lady (even more lucky to live there) and kind enough to let me in. 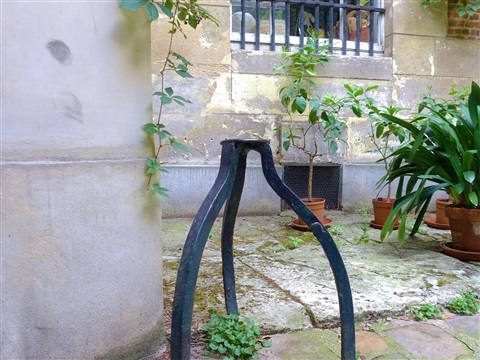 A few curiosities: in the first courtyard, hidden behind the flowerpots, a very old well; in the second courtyard, a wrought iron tripod used in the past to dismount more easily from a horse (last remaining pas de mule in Paris). 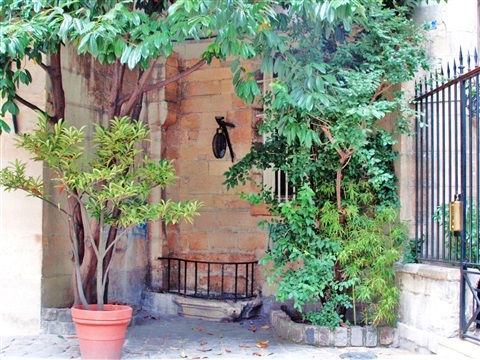 The third courtyard opening on passage du Commerce (joining Boulevard Boulevard Saint-Germain with rue Saint-André-des-Arts), is where the painter Balthus had his studio up several flights of the outside stairs.